Rachel Carson’s second book proved amazingly popular for a natural science book written for the general reader. It went immediately into multiple printings and was also printed in large numbers as a Book of the Month Club selection. The book won the National Book Award in 1952 and was also made into a documentary film that won an Academy Award in 1952. The tremendous popularity of Carson’s second book had important implications for her future work. Most particularly, the publication of her next book “Silent Spring” was by a mainstream publishing house – Houghton Mifflin – that probably did not realize the controversial nature of her new book. “Silent Spring” was perhaps the keystone upon which the environmentalist movement was built. More information on Rachel Carson and her life and work is available at: www.rachelcarson.org and other web sites. Squid Ink had listed for sale what I thought was a first printing of “The Sea Around Us” when Steve Messier emailed me with a number of very specific questions about my copy. It was obvious that he knew much more about the printings of this book than I did, and we have been emailing ever since. Steve has written a detailed narrative about his research on this book and his essay follows. I have extracted the key points of interest to collectors and book sellers that relate to identifying the Oxford University Press true first edition 1st printing of the book. It is important to note that almost all copies listed as such are actually book club printings and that the Oxford 1st printing is very scarce and seldom offered in the market place. Later printings by Oxford University Press state the printing number on the copyright page. The book itself is 8 ½ inches tall; has straight cut page edges top, bottom, and front; and has a green and white (sometimes age faded to appear green and yellow) stitched cloth backing to the page block. A box or carton (exact number unknown) of the 1st printing books were sent to Carson, well before the book went on sale. Carson personally mailed them out for review. The pictorial boards were easily rubbed and damaged and were not acceptable to Carson. These dull board, reviewer copies are the first state of the 1st printing. Oxford University Press had all remaining copies of the 1st printing rebound in a glossy “plasticized” paper over the boards (Photo 4). The boards were still pictorial and mimicked the dust jacket. The second state of the 1st printing is characterized by these highly glossy boards (print run unknown). Dust jackets of the 1st printing have three horizontal bars at top of the front flap, while later printing jackets have only two bars; there is no price on the jacket flap; the first state of the jacket has no reviewer blurbs at the bottom of the front flap; the second state of the 1st printing jacket has review blurbs at the bottom of front flap by John Kieran and Waldo L. Schmitt. We do not know if some second state books were released for sale with first state dust jackets, but this a slight possibility. The third state of the jacket added a third reviewer blurb, by Frank Dufresne, and eliminated the third bar at the top. The second state of the 1st printing can probably be found with either a second or third state dust jacket. Although book club editions have essentially the same title and copyright pages as the true 1st, most club printings also state “BY H. WOLFF, NEW YORK at the bottom of copyright page. Book club versions are usually 8 3/8 inches tall and are rough cut on the front page edges. All book club editions have the page block glued directly to the spine with no cloth backing. 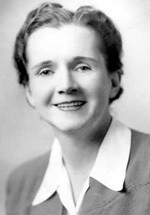 Rachel Carson published three works of nonfiction about the sea. Her first, published in 1941 by Simon and Schuster was “Under the Sea Wind”. Ten years later, Oxford University Press released “The Sea Around Us”, and the final book of the trilogy was “The Edge of the Sea,” published in 1955. There is little confusion as to what determines a first edition and original dust jacket for her 1941 and 1955 releases, but “The Sea Around Us” presents collectors with a variety of dust jackets with at least four different sets of text. I am collector of natural history books, and establishing how to identity of a first printing of “The Sea Around Us” proved maddening. After queries to Oxford and dozens of book dealers it became apparent that no one could provide the printing history of this particular book. Finally, in April of this year (2008), with the help of the staff and some personal research at the Beinecke Library at Yale University in New Haven, Connecticut , the story surrounding the printing of the book unfolded. Their collection of Rachel Carson’s manuscripts and correspondence cleared up many mysteries. Hopefully, this essay will help book dealers and collectors to assess their copies of her best-selling work, “The Sea Around Us”. On March 15 a box of the earliest printing of her books was sent to Rachel Carson, and she was not completely impressed with the product. She liked the design on the jacket and boards of a blurred view of some oceanic life form on a pea-green background. “How mysterious it looks”, she commented, which was exactly the mood she wanted to convey to the reader. “The Strimbans” written in cursive at the lower right of the dust jacket front cover credited the artist brothers who made the mobile and photographed it diffused. The correspondence between Rachel Carson and Oxford during the months of March and April of 1951 provides important information regarding the first printing of “The Sea Around Us”. A one page list of magazines and scholarly publications, and a handful of respected authors meant probably fewer than one hundred original copies were sent out for review. These copies were bound in a paper that was easily scratched or eroded from rubbing. The rebinding of the remaining original copies, as described by Henry Walck, and the second printing changed the dull surface texture of the book cover to a glossy sheen. In addition, it became much more durable, and far less susceptible to rubbing and shelf wear. After the second printing, the boards remained slightly plasticized, but were not nearly as glossy as were the second state of the first printing and the second printing (see Photo 3 and Photo 4). No price listed on the jacket. No reviewer blurbs on the front flap. panel of the dust jacket. Text about “The Author” ends with "coral reefs" on the back panel of the dust jacket. Oxford written on the spine of the jacket one half inch up from base. Advertisements for IRIS books on the back jacket flap. This first state dust jacket lacks any reviews on the front jacket flap, and has three bars (meant to suggest fathom marks) on the top of the front flap above a preview of the book. These three bars match the three found on the backs of all first edition dust jacket states and rear jacket flaps (prior to the introduction of a priced dust jacket on a much later printing). Later Oxford University Press printings state the printing number just above the copyright information (see Photo 8). The date Oxford had set for publication was July 2, 1951. According to an April 19 correspondence to Rachel, John Kieren and Waldo Schmitt’s comments would be included on the jacket that would cover the new (plasticized) boards. This second state dust jacket added these two authors’ review blurbs to the bottom of the front jacket flap, but preserved the three bars at the top (Photo 9). By June 14, Rachel received the new plasticized versions of “The Sea Around Us”. The book is identical to the “paper” 1st state copies in every way except for the glossy boards. But all was yet not well. Rachel had new concerns to share with her publisher, as some copies were scuffed, and one cover was even attached upside down. A frustrated and exhausted Rachel complained, “This whole binding business is a mess.” Nevertheless, the new bindings were more attractive and durable than the review copies. When held under a bright light there is a noticeable difference in the reflectivity of the enhanced cover compared to the original copies, and they should show less shelf wear than 3rd and later printings. Plasticized versions also tend to have a slightly yellower hue than the paper versions. This could be due to the rush to produce the new boards or because of the plastic aging. On July 2, Oxford released a “limited number” of copies of “The Sea Around Us” for sale, despite earlier pleas from Rachel to increase the count. Due to prior publicity in The New Yorker and a favorable July 1 front page feature in the The New York Times Book Review, it only took one day for the first and second printings to sell out. The print runs for the 1st and second printings is unknown, but I assume the number was not very great. Oxford quickly ordered third, fourth, fifth, and sixth printings (so stated), but with the staff on vacation, limitation of paper, and only one set of plates, there was some delay. Very shortly after the release of the “Kieren/Schmitt” dust jacket, a third state dust jacket appeared. (I have such a first printing copy inscribed July, 1951). A third review blurb, by Frank Dufresne, had been added on to the bottom of the front jacket flap leaving insufficient space for the three bars at the top (Photo 10). This dust jacket, and those of all later states have two bars on the top of the front jacket flap. In March of this year (2008) my survey of over one hundred ABE book dealers advertising first edition copies of “The Sea Around Us” turned up only two copies with three bars on the front jacket flap, reflecting the scarcity of the true first printing. This also indicates that a very high percentage of copies offered for sale as “First edition 1st printing” are actually book club printings. The three dust jacket states described above can be found on what should be considered as first printing versions (paper or plastic) of “The Sea Around Us”. The third state dust jacket can be found on first, second, and third printings. It is important to note that the third printing boards were covered in more durable and less shiny paper. The second printing boards are plasticized, so it appears that the enhanced, highly plasticized very glossy boards were restricted to the first and second printings released on July 2, 1951. According to a large advertisement in the July 7, 1951 edition of The Saturday Review of Literature, the book could be purchased for “$3.50 at all bookstores”. Since the early printings did not have a price included on the dust jacket, some dealers entered one by hand. And, even though the reviews by William Bebee, Thor Heyerdahl, and Admiral Byrd weren’t secured in time for the first printings, the ad included praise from all three of these authors from whom Rachel had hoped to hear. By the fourth printing, Thor Heyerdahl’s quote appeared on the bottom front flap of the dust jacket, replacing the three previous authors, Kieren, Schmitt, and Dufresne. This fourth jacket state includes the authors listed in the July 7 ad, as well as Kieren, Dufresne, and John Barkham on the rear dust jacket flap. This particular dust jacket is the most common variety as it persisted for numerous printings through 1951 and 1952.
text on the back panel of the dust jacket. Thor Heyerdahl’s quote is on the bottom of the front jacket flap. "The Thrill of Discovery’ is at the top of the back flap beneath three bars. Quotations by seven authors or publications are on the back jacket flap. commonly found on book club printings. By the week of July 22, 1951 Rachel’s book was on the New York Times “Best Seller List” as number five and was second on the Washington Star’s list. Publisher’s Weekly reported that it was a “runaway best seller.” Copies were flying off the shelves and Oxford University Press couldn’t keep up with the demand. In an August 7 letter, Henry Walck told Rachel that they could only supply 15,000 copies in the next two weeks, but he promised, “After the 23rd [of August] we will bombard booksellers.” By August 25, with the fifth printing on the shelves, an estimated 60,000 copies of “The Sea Around Us” had been sold. Sales continued unabated. One hundred thousand copies had been sold by Oxford in early November representing eleven printings. 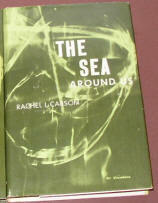 “The Sea Around Us” was selected as an alternate Book of the Month Club selection for September, and by the end of 1951 BOMC reported having sold 167,181 copies. All these book club copies apparently had fourth state dust jackets. In February, Oxford Press decided to revise the biographical information on the dust jacket to include mention of the award. This change took place with the sixteenth Oxford printing, at which time a fifth state dust jacket appeared. “The Strimbans” has been removed from the front panel of the jacket. No price indicated on the front dust jacket flap. A blurb from The New Times Book Review has been added below Heyerdahl’s blurb. "Under the Sea Wind” is advertised on the back panel. Text about “The Author” has been moved to the back flap and the seven quotes deleted. Mention of The National Book Award is included on the back flap. The Guggenheim Fellowship is mentioned in the text on the back jacket flap. A price of $3.50 is present on the bottom corner of the front flap. Burroughs Award and the Medal of the New York Zoological Society. Mention of the Guggenheim Fellowship has been removed from the rear flap. There were several variations of the texts during the run of numerous Oxford and book club printings of “The Sea Around Us”. Several book club copies appear to be first printings because they have no mention of later printings. In addition, unlike many book club editions, “The Sea Around Us” did not have any physical markings such as blind stamps to identify a book club copy. Most book club copies can readily be identified by the presence of H. Wolff on the copyright page. But some club copies do not mention H. Wolff. Fortunately, all book club copies have one thing in common: the text block is glued directly to the spine. All Oxford University Press printings have a green and white (usually faded to appear somewhat green and yellow) stitched cloth backing (Photo 11) to which the page block was fixed before being glued to the spine. The first of the book club editions has a page block with a rough cut to the front page edges. The boards and a fourth state dust jacket measure 8 and 3/8 inches tall. As in most book club printings “BY H. WOLFF, NEW YORK” is included beneath the copyright information. Other later book club copies that can be mistaken for first printings are found with fifth and sixth state dust jackets. One unusual book club edition has the priced, sixth state jacket with the front page edges cut straight and with boards that are 8 ½ inches tall. There appear to be other variations in the bindings and dust jackets of the printings of “The Sea Around Us” that I am not aware of, given the numerous printings of Carson’s book. More research is needed. But, armed with the publishing information provided above, book dealers should be able to provide more accurate information about copies of “The Sea Around Us” offered for sale. Book collectors should realize that the true first printing (and second printing) of this title are quite rare, and this information should help collectors determine what variant they might own or be considering for purchase.